Unlike other construction companies whose initiatives may be less than environmental and whose skill sets are often limited to one area of focus, Green Homes provides clients with a trusted level of high performance building services. We also use a boutique approach to keeping projects on track and on budget—which means that the principals can often be found at the top of the ladder or the bottom of a foundation trench. Point is, we micro-manage every aspect of our jobs, including your satisfaction. Passive House is a standard that produces the highest energy efficient buildings. A passive house is nearly air tight and super insulated, allowing virtually no heat or cooling to be wasted. A typical passive house building consumes 90% less heating and cooling energy and has 70% less overall energy consumption than a standard home. High indoor air quality is achieved through a mechanical device that exchanges outdoor air with the indoor air. The owners of Green Home are both passive house builder rated from the Passive House Institute of the United States (PHIS) and work closely with passive house rated and energy conscious architects. Net Zero Energy is when a house’s energy usage is equivalent to or more than the renewable energy it produces over a year. A Green home is able to do this because of their minimal waste and other energy efficient technologies. Net zero homes contribute less overall green house gases to the atmosphere compared to a regular house. The EPA’s Energy Star Certification is a label placed on homes that follow superior energy saving guidelines. Over 1.5 million Americans choose to live in the quality and comfort of an energy star certified home. It allows for consistent temperature through each room, better water management, home durability, and reduced air leaks and drafts. 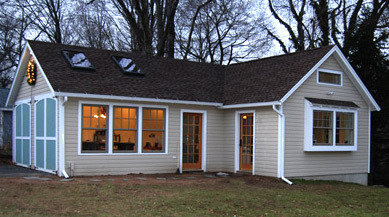 Each of these homes deliver up to 30% energy savings when compared to a typical home. Our network of architects can craft the perfect plan for your project; whether you’re remodeling a 1920’s Dutch Colonial, adding a sun porch onto your cottage, or starting from the ground up, literally. We’ve been building since 2004, and are equally as comfortable remodeling kitchens as we are framing a 3-story houses. Something about the hands-on nature of hammering nails and creating something where there was nothing, never loses its genuine appeal. Our process includes any or all of the following: full service general contracting, new construction, additions, renovations and remodeling, custom woodworking, all associated plumbing, electrical, painting and finishing work.